Coming Soon; A Bridge Over Troubled Waters! 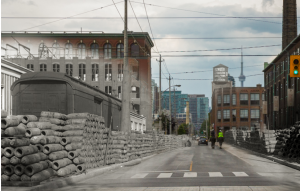 #LibertyVillage #TOPoli – Accurate (Peel) Appraisals Inc.
Liberty Village has procured from the City of Toronto a commitment to build a 15 metre wide covered causeway over the Metrolinx/CN railway line. This progressive thinking rockets Liberty Village forward in a quantum like leap in becoming a tangible community of the future. 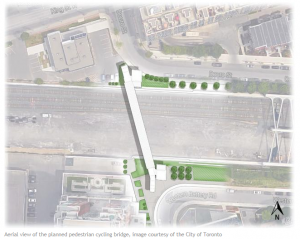 Will the Village be blessed with a future Metrolinx station to better serve the community & the city as a whole ? That remains the $20,000,000 question? By acting positively about good public transport & it`s supporting infrastructure Toronto can truly move much closer to becoming a world class city. May we extend a real “Tip of the Hat” to all those that are making this modestly avant garde concept a living reality. Congratulations !